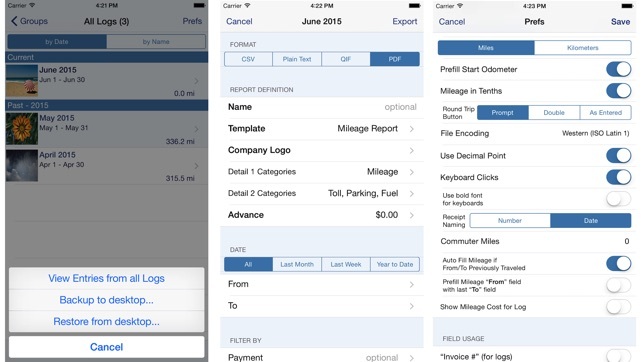 MileTracker is the easiest and most feature rich app to track your mileage & driving expenses. Get ready for 2018 and start saving money now! MileTracker allows you to track mileage the way YOU want offering several different methods. Then when tax time arrives or expense reports are needed, you can easily create beautiful reports (accountants love our reports too). 1. 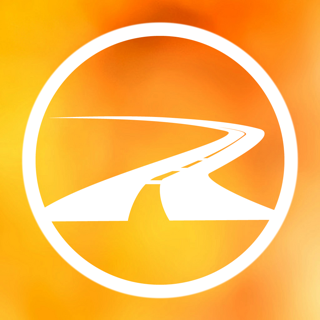 LIVE mileage tracking - the app will track your every move via GPS. This feature requires you to tell the app when you start and stop. (optional AutoTrack add-on is available for fully automatic tracking - see below). * When saving a Toll, Fuel or Parking entry it will show in the Merchant screen a list of nearby merchants from a worldwide database of stores and companies. 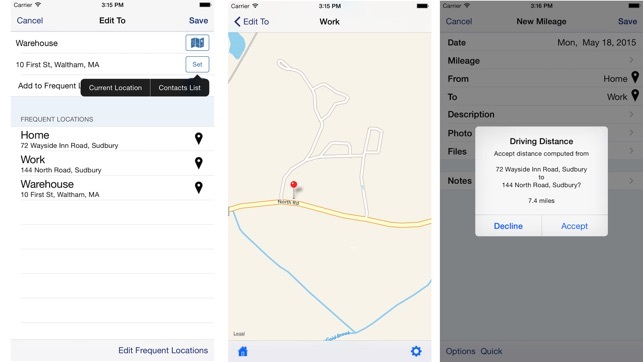 * When using the optional AutoTrack feature, when approving a drive, it will show a list of nearby stores and companies when assigning a Nickname for that location. IF your suggestion did not make it in to this release, please email us again if you feel strongly about a certain feature and we will revisit it for possible inclusion into the next release. ALSO, do not forget to post a new review or update an existing one. Reviews help new potential customers see how the app is working for you. New users of MileTracker allow us to futher invest in the app and release more free updates. IF, you encounter an issue, PLEASE do NOT post a review right away but instead please give us the opportunity to resolve the problem. We have seen most every issue and likely have an easy solution. So first email us at info@silverwaresoftware.com or go into the Prefs screen inside of MileTracker and tap the "Email the Author" link. Thank you for making MileTracker a top choice among mileage tracking apps. It was a bad time for the app to ask me to rate it. I'll start with one star until I find that I am the problem, not the app. It is irritating that on occasion I open the program and I don't see data I've previously entered. I can't find it. Other times, for reasons I don't understand, the data is present. There may be a simple answer to my problem, but I would simply prefer that the data appear when I open the app. Another annoying thing is preparing reports from data I've entered. I own rental properties and , in one case, I must keep travel expenses separate for two condo units within a single development complex. I haven't found the reports flexible enough to handle this problem. As I've said, perhaps I am the problem, not the app. But, unless I can find myself far more satisfied with the app than I am at the present time, I will delete the app and search for what I consider a better one that meets my needs with fewer problems. Hi, I read your review today and I think all can be resolved with a simple phone call. I can give you a quick tour of how the app works. The unique feature is the concept of Logs. 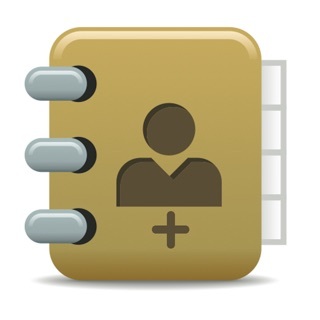 Logs are simply folders which help you organize your entries. As for the reports, the app is one of the most flexible and feature-rich. I can help you with this via email or if you wish via a phone call. Since we are not provided contact information for you it will be up to you to reach out and provide us with your contact information. 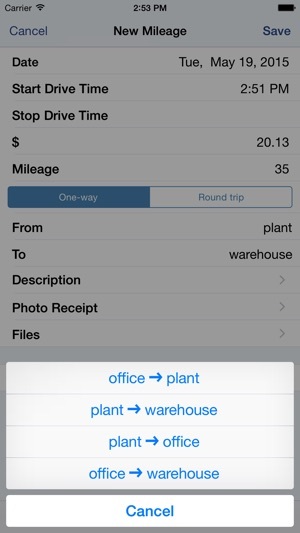 Just tap the "Email the Author" link within the Prefs screen within MileTracker. 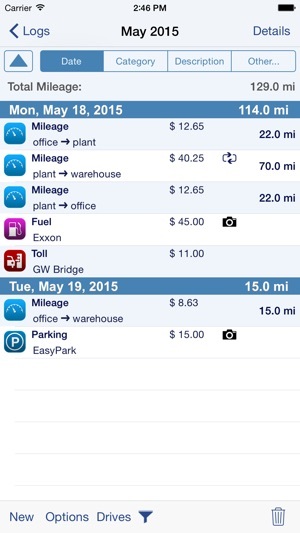 I have tried several of these mileage apps and settled twice on MileTracker. I don't want automatic tracking while I drive (uses space and battery in my phone) - I travel to the same local places almost all the time. This is absolutely the only app that makes it easy to designate and name favorite locations and track round trip mileage to them easily and MileTracker always delights me when it designates my starting point as the place where I currently am. 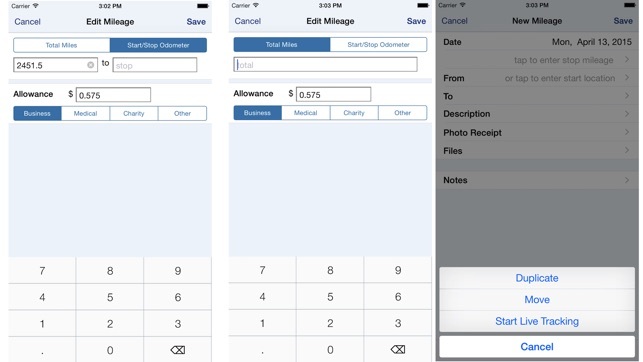 Also, for several years I have used this app to create yearend reports that have passed muster with my accountant. Don't look further than this app - simple and just what you need. Started with this app a couple of years ago after having used a program tied into Garmin. I keep mileage tracker running 24-7 to track business miles. It doesn't seem to affect my iPhone much in the way of battery, data or performance. The only concern I have is that sometimes it doesn't "engage" for the lack of a better word. It stops recording activity. It has happened enough that I'm now in the habit of pulling the app up each day just to check. Seems to help. Overall it's a great app and makes sense to have on a smart phone. Don't ever have to worry about moving equipment to different vehicles. Consistent and mostly reliable. Price is well worth it.